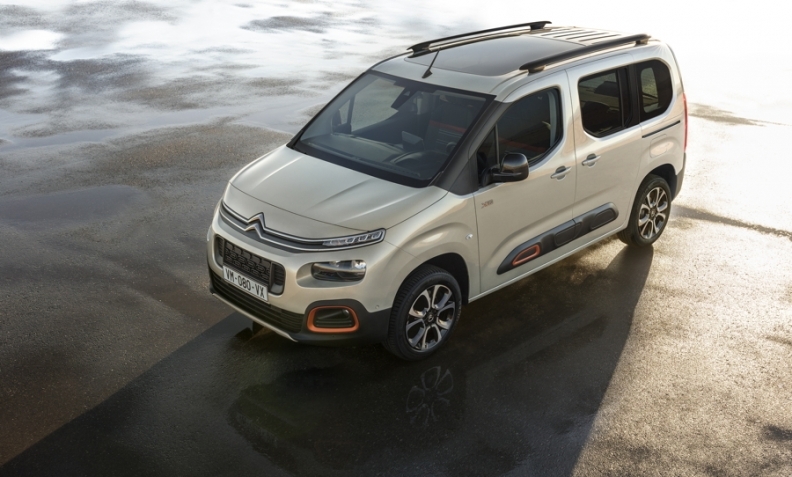 The Berlingo has been redesigned to include Citroen's latest styling cues, including padded "air bumps" on the lower edge of the doors, a two-tiered lighting arrangement in front and trim accents in contrasting colors. PARIS -- Citroen has released details of its third-generation Berlingo compact passenger van, which will be available in two lengths for the first time and with five or seven seats. Commercial panel vans will also be available. Both versions will appear in showrooms in September. The new Berlingo will be displayed at the Geneva auto show next month. Sister versions from Peugeot and Opel/Vauxhall will be revealed next week. The underlying platform is a combination of the existing architecture at the rear and PSA's EMP2 platform in the front. Development of the vans began under a joint program with General Motors, before PSA's purchase last year of Opel and Vauxhall from GM. The Berlingo will have two engine choices: a 1.2-liter gasoline engine with 110 hp or 130 hp, and a 1.5-liter diesel with 75 hp, 110 hp or 130 hp. The shorter version, which Citroen calls M, is 4400mm long with a wheelbase of 2780mm, and the XL version is 4750mm long with a wheelbase of 2970mm. Citroen says luggage capacity is 775 liters and 1,050 liters, respectively. Each version is available with five or seven seats. Citroen says it is moving the Berlingo upscale, and has added comfort and technological features. Driver-assistance and safety devices include a head-up display, adaptive cruise control, hill descent control, a backup camera with top-rear vision and lane-departure warning. The redesigned interior includes up to 28 storage compartments and wireless mobile phone charging. The 8-inch touchscreen is compatible with Android Auto, Apple Car Play and MirrorLink. The company is emphasizing the Berlingo's interior modularity and flexibility. Three individual second-row seats fold to create a flat floor, and the optional third row seats are removable. The tailgate has an opening rear window to ease loading in tight spaces. The Berlingo will be produced at PSA's plant in Vigo, Spain. Citroen says it has sold more than 1.7 million passenger Berlingos since 1996 and more than 3.3 million overall, including panel versions. Last year more than 165,000 second-generation Berlingos were produced, the highest number ever for a model that was introduced in 2008. It is the top-selling Citroen model in more than 15 countries, the company said. The Berlingo competes in Europe's car-derived van segment, which is growing, according to figures from JATO Dynamics. Last year the segment gained 11 percent for a total of 283,830 sales. Berlingo sales fell by 4.9 percent to 37,792, though the model remained in second place behind the Volkswagen Caddy, with 57,020 sales. The Dacia Dokker ranked third, with 37,076 sales.